College student debt has quickly grown into a national crisis. The average total debt for students graduating from the University of Illinois, Urbana was $25,000 in 2012. Tuition and fees at UIUC have increased 74% over the past decade. A 25% tuition cut for either all in-state JUNIORS or SENIORS* will dramatically help Illinois families and students afford college, graduate with less debt, and make the taxpayer dollars that go towards financial aid go even further. With that kind of money floating around the athletic department, it’s safe to say that financially, they’re doing just fine. And, incidentally, the Univ. of Illinois athletic department contributes no money to the University. The revenue for the athletic department comes from a variety of sources. But the biggest single source is the Big Ten Conference & the NCAA. Every team in the Big Ten receives an annual lump-sum payment from the conference as its share of revenue from TV contracts, the NCAA, Bowl game payments, and other income. 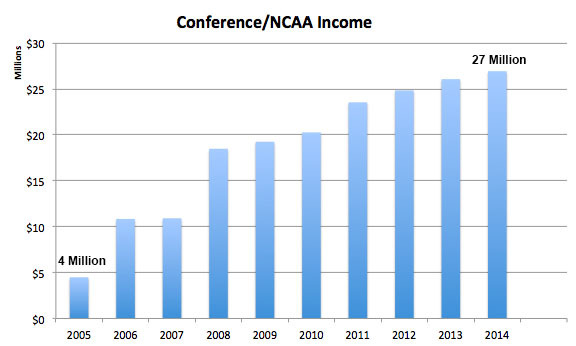 This Conference/NCAA revenue has grown dramatically and steadily year after year. Over the past decade, it has increased by a factor of SEVEN, a total increase of $23 million per school (see graph below). This year, the NCAA signed an unprecedented television contract with ESPN. The network will pay the NCAA $7 BILLION dollars to broadcast the new college football playoffs. That money is being split among all the schools, with the members of the power conferences getting the largest share. 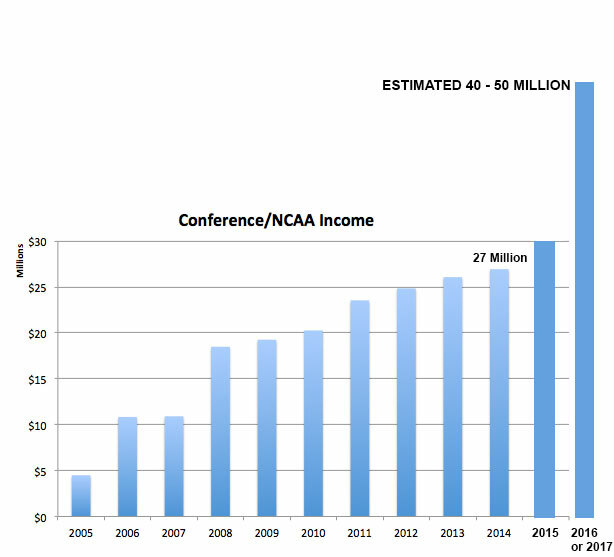 Adding in the estimates from the future new Big Ten TV contract, it is estimated that the Conference/NCAA revenue for all Big Ten teams will almost double, to nearly $50 MILLION per school by 2017! The graph below shows what an absolutely stunning increase that is. So, with athletic departments already awash in cash, why not share this incredible windfall to help solve the tuition problem? This involves absolutely NO CUTS to the athletic department. It can continue to pay all the same salaries it is paying now. It can continue to operate exactly as it is today. It will even get a raise in revenue. It just won’t be getting all of this new, additional money. 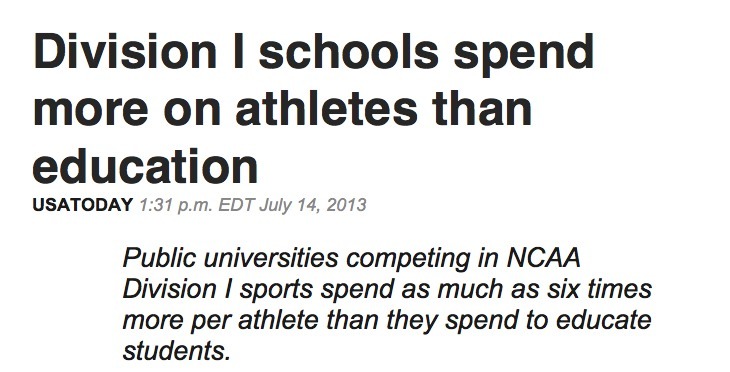 While it is rare, sharing athletic revenue with academics is not unheard of. The University of Texas, the country’s most profitable football operation, gave $8.3 million of its football revenue to the institution in 2011-12, after giving $9 million in 2010-11. The key questions are: WHAT SHOULD BE THE PRIORITY? The wealthiest employees in the state and on the campus, or over seven thousand Illinois families and students who need some financial relief? WHO NEEDS THIS FINANCIAL HELP MORE? “The University of Illinois in June announced a massive fundraising campaign for financial aid assistance, its latest effort to help struggling students pay for college. It is a simple question of fairness. Why don’t we share this cash windfall? Isn’t that the most fair outcome? A WIN – WIN – WIN for everyone.